Oli rang me up the other day and was pretty excited: “Man! I have an idea for a shoot”. 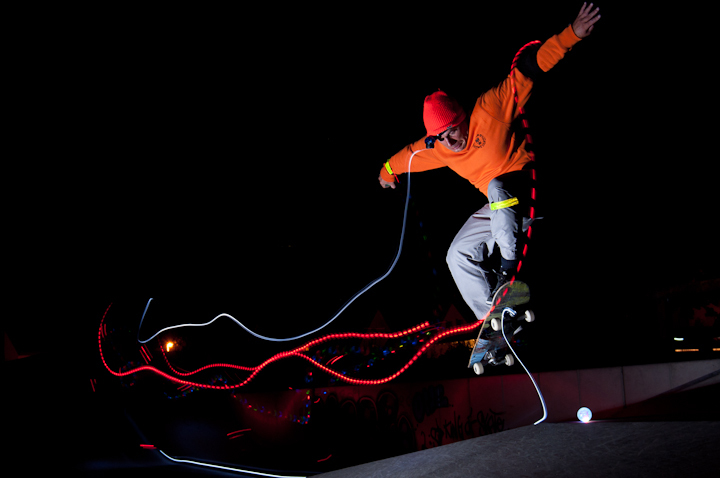 A couple of LEDs, a lonly skatepark far off, darkness, my good old SB800 – that I haven’t used for ages – et voilá…. looks easy, doesn’t it?. Actually, this was one of the later shots. Oli had to get used to the dim light and I had to trigger my flash at the right time. Not easy at all and happily no bails at all, and so sometimes the magic happens….